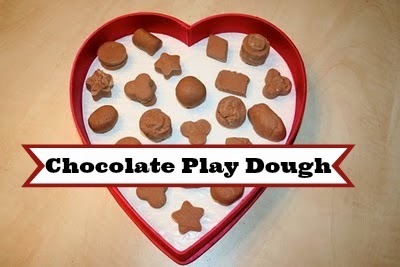 This yummy looking box of chocolates isn't what you'd expect: it's Chocolate Play Dough! This is something I found that is just as fun to make as it is to use. We made it last Valentine's & have done again this year. Our homeschool topic this week is everything Valentine's Day, so thanks to some great online sites and the local library we've got fun projects like this, tasty treats to make, learning about the symbols of Valentine's Day and of course lots of cards to create. So much fun!! Bring water & salt to a boil. Stir in remaining ingredients. Allow to cool slightly. Knead until smooth. Easy to make using stuff already in the house and it keeps for 4wks in an airtight container. It even smells yummy! And, thanks to my very candid sister, my "swirl" candy design also looks like poo, so this also scores points for lovers of bathroom humor. That is always a favorite recipe!! I love making play dough! Your chocolates are super cute (and yummy) looking! It looks just like chocolate....but I'm afraid my kids would be too tempted to eat it (not that it would hurt them, but...).